Need to know the current zoning of your property, future land use designation or other development information? Use the interactive map below or contact us by calling (509) 575-6183 or emailing to: ask.planning@yakimawa.gov. The City of Yakima is divided into several zoning districts (see zoning district definitions). Land uses are categorized by what zoning districts they are allowed in and are designated a level of review that the proposed land use would need to go through with the Planning Division in order to be permitted. Table 4-1 Permitted Land Uses in Title 15 of the Yakima Municipal Code lists all land use categories that may be permitted based on zoning district. 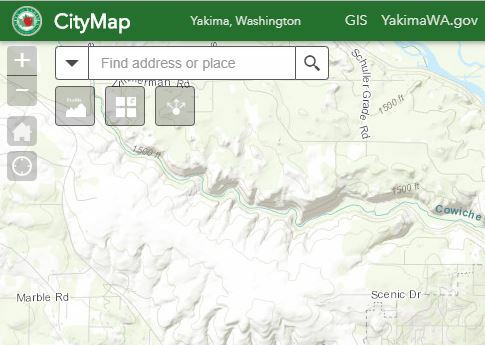 The City of Yakima CityMap allows you to look at and analyze a variety of data layers. You can locate properties by parcel number, situs address or geocoded address. Use the tools to navigate, identify or measure in the map window. Choose tools in the upper bar. The new features of this mapping application are faster drawing times, better cartography and more current data. CityMap is responsively designed and no longer requires a Flash plug-in. You can run it on smart phones, tablets or desktops. Need help using CityMap? Contact us at (509) 575-6183 or email to: ask.planning@yakimawa.gov. We are happy to look up information for you. Note: Information may not be current to date. The City of Yakima is not responsible for any incorrect information derived from the GIS system!